David Lawhon was born on March 21, 1935, in Loudon, Tennessee. He enlisted in the U.S. Army on August 11, 1953, and completed basic training at Fort Jackson, South Carolina, in November 1953. Pvt Lawhon next attended Advanced Individual Training as a Pipeline Specialist at Fort Leonard Wood, Missouri, from December 1953 to April 1954, followed by service as a Pipeline Specialist with the 388th Engineer Pipeline Company in South Korea from May 1954 to April 1955, and with the 82nd Engineer Pipeline Company in South Korea from April to September 1955. His next assignment was as a construction helper with Company A of the 554th Engineer Battalion at Fort Leonard Wood from September 1955 to March 1956, and then as a barracks supervisor at Fort Crowder, Missouri, from March 1956 until he left active duty and entered the Army Reserve on October 11, 1956. Sgt Lawhon returned to active duty on October 9, 1958, and attended Military Police School at Fort Jackson from October 1958 to February 1959. He served as a Military Policeman with the 293rd Military Police Company at Fort Ord, California, from February to March 1959, and then at the U.S. Army Garrison at Fort Hunter Liggett, California, from March to August 1959. Sgt Lawhon then served with the U.S. Army Garrison in Ankara, Turkey, from August 1959 until he left active duty and returned to the Army Reserve on November 10, 1959. He then returned to active duty beginning on February 11, 1960, and served as an infantryman with Company D, 2nd Battalion of the 117th Infantry Regiment at Lenoir City, Tennessee, from February to April 1960. Sgt Lawhon attended Ammunition Specialist training with the U.S. Army Training Center, Armor, at Fort Knox, Kentucky, from May to August 1960, and then served as an Ammunition Sergeant with the 32nd Armor Battalion at Fort Stewart, Georgia, from August 1960 to July 1961. He next attended Special Forces Demolition Specialist training with the U.S. Army Special Warfare Center at Fort Bragg, North Carolina, from July to December 1961, followed by Medical Specialist training at Fort Sam Houston, Texas, from January to September 1962. Sgt Lawhon served as a Medical Specialist with the Hospital Detachment at Fort Campbell, Kentucky, from September to November 1962, and then as a Demolition Specialist with Company B, 5th Special Forces Group at Fort Bragg from November 1962 to November 1964. His next assignment was as a Medical Specialist with Company A, 10th Special Forces Group in West Germany from November 1964 to January 1966, followed by service as an instructor with the U.S. Army Special Forces Training Group at Fort Bragg from January 1966 to August 1967. Sgt Lawhon served as a Medical Specialist with Company B, 5th Special Forces Group in South Vietnam from August 1967 to August 1968, and then as a Medical Specialist with Company C, 7th Special Forces Group at Fort Bragg from September 1968 to October 1969. His next assignment was as a Medical Specialist with Headquarters Detachment, U.S. Army Topographic Command Corps in Washington, D.C., from October 1969 to April 1970, followed by service as a Medical Specialist with Company C, 7th Special Forces Group at Fort Bragg from April 1970 to July 1971. During this time, SFC Lawhon served on the Greenleaf Support Group during the Son Tay Raid, a clandestine mission to rescue American Prisoners of War in North Vietnam on November 21, 1970. He served as a Medical Specialist with U.S. Army Vietnam in the Special Missions Advisory Group in South Vietnam from August 1971 to March 1972, and then as a Medical Advisor with the Army Advisory Group in South Vietnam from March to August 1972. His next assignment was as a Medical Specialist with Company B, 2nd Battalion of the 5th Special Forces Group at Fort Bragg from September 1972 to April 1975, followed by service as Chief Medical NCO with Headquarters, 2nd Battalion of the 5th Special Forces Group at Fort Bragg from April 1975 until his retirement from the Army on March 1, 1976. David Lawhon died on April 8, 1995, and was buried at the Pine Grove Cemetery in Lenoir City, Tennessee. 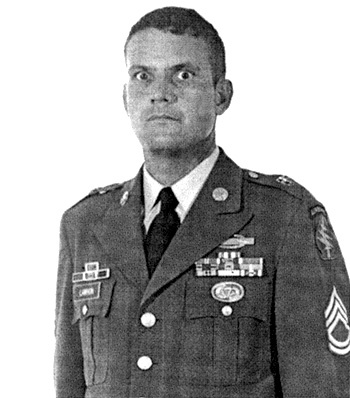 Sergeant First Class David A. Lawhon, Jr., United States Army, distinguished himself by gallantry in action on 21 November 1970 as a member of an all-volunteer joint U.S. Army and Air Force raiding force in the Joint Chiefs of Staff directed heliborne assault mission to rescue United States military personnel held as prisoners of war at SON TAY Prison in North Vietnam. This valiant effort was promoted by deep compassion for his imprisoned fellow men-at-arms, and by a strong sense of military duty and national pride. Sergeant Lawhon displayed unusual courage and skill as he led his element in the initial assault on the objective. While engaged in a building-clearing operation, he unhesitatingly braved automatic weapons fire to eliminate potential threats to the mission. His swift and positive combat actions contributed directly to the overall success of the operation. Sergeant Lawhon's conscious disregard for his personal safety, extraordinary heroism against an armed hostile force, and extreme devotion to duty are in keeping with the highest traditions of the military service and reflect great credit on him and the United States Army.